Keeping your footwear store operations in tip-top shape entails understanding your business and knowing how to stay lean, develop season specials, monitor the fast-sellers and implement cost-effective business processes and relationships. You also need the power to serve the needs of the store and that of your customers — whether one is responding to seasonal buys or simply processing complex transactions at the POS station. Our footwear software solution provides footwear store retailers the right business tools to help compete effectively in an ever-changing and demanding marketplace. Easy to install and use, a flexible, affordable footwear POS software solution can effectively manage all aspects of your store’s inventory. Manage a large range of merchandise shoe assortments — with ease. Keep track of every item — from seasonal, casual, dress to sportswear and anything in between. 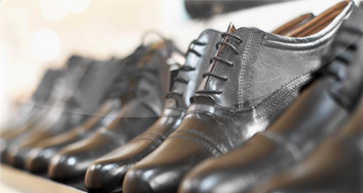 Easily track and manage shoe assortments and non-inventory related items. Make better buying decisions based on accurate sales information and inventory records. Ensure customers and employees are happy with efficient item lookups. Improve speed at time of checkout and deliver better and improved customer service.